Hot Shots 14U Greeson takes home the USSSA GOLD CHAMPIONSHIP 9/17/2016. 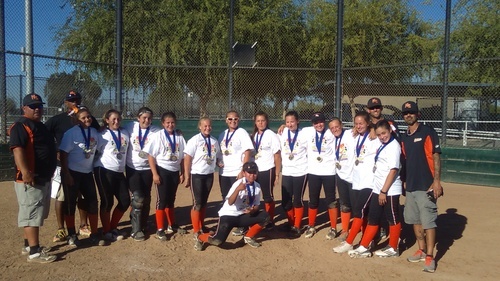 The team went 3-0 Saturday seeding 1 in their pool & going 3-0 Sunday to win the championship. Sunday Beating Delta diamonds 5-2, playing our other 14U Hot Shot team in the semi final game beating them 9-3 and finishing off all American Sports Academy 6-0 to win the Championship. Congrats girls!!!!! All your hard work pays off!!! !